Service | Automotive Equipment, Inc. When you call us for service, you can trust us to take care of your equipment, leaving you to take care of your customers. Call (316) 425-3221 or scroll down to submit a service request. Did we miss something? We service everything! Let us know what you need and we’ll take care of it! Give us a call at (316) 425-3221. Have an air compressor that needs monthly service? Or a lift that needs yearly inspections? Or a waste oil heater that needs yearly cleanings? Let us know! We’ll put your service on our calender so you don’t have to waste your time scheduling the routine service every time. Need to skip a rotation? Just let us know! 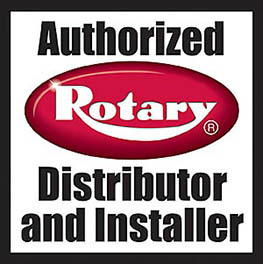 We are Rotary Authorized Installers. With years of experience and Rotary’s training, we are professionals when it comes to installing lifts. See how this benefits you! We are ALI certified. What does this mean? It means we have gone through classes, taken tests, and completed practice inspections so that we could become an expert in lift safety! Our sharp eye and extensive history with lifts come in handy in catching potential hazards before they become safety issues. Learn more about ALI (Automotive Lift Institute) on their website. Let us take care of you so you can take care of your customers! Call (316) 425-3221 for any service needs or questions. Have a service need? Let us know! Submit your service request and we’ll call you within 1 business day to confirm.